Discussion in 'Ad Campaigns' started by MDNA, Jul 14, 2018. Gigi and Bella are unnecessary here, but I love the rest of the cast. Rianne, Fei Fei, Yasmin, and Imaan are a pleasant surprise! I hope they get plenty of shots. Apparently this will feature 54(!) models. The whole campaign is on versace.com. 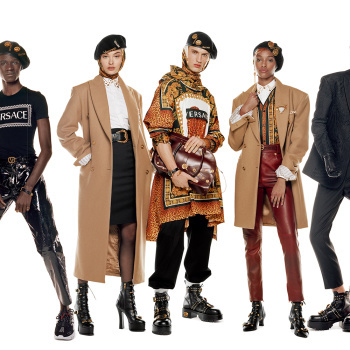 SHOT BY STEVEN MEISEL, THE VERSACE FALL WINTER 2018 CAMPAIGN FEATURES THE LONGEST-EVER ADVERTISING IMAGE. 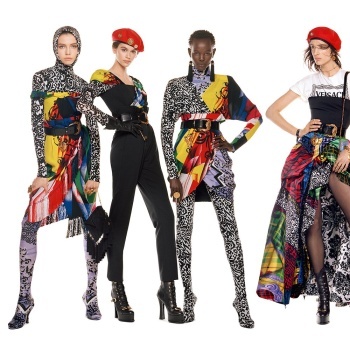 SIDE BY SIDE, THE NEVER-BEFORE-SEEN IMAGE FEATURES A CAST OF FIFTY-FOUR MODELS SYMBOLIZING INCLUSIVITY AND DIVERSITY, KEY VALUES FOR DONATELLA VERSACE AND HER VISION FOR THE BRAND. Come on Versace. Why aren't you giving the opportunities someone who actually walked Versace? In this campaign, there are literally about 10 male models who didn't walked Versace last season. Umm.. looks like something for GAP. Oooh exciting. Wonder if any magazine will run this as a giant foldout! Should have just made this the ad. The whole thing looks diffusion-line worthy at best. Amazing cast but too bland, it lacks personality and the styling gives me headache. This mess actually elevates the crap he did for Givenchy. Too sad they wasted a big opportunity to make something iconic into this! It's too plain. I wish the cast was narrower or to make it more remarkable, it would have been cool if it were only one girl (cough, Imaan, cough) shot in different poses and dresses all next to the one! Like this, it looks like a catalog, the background is so sad and the shoot feels lifeless. Long are the days of advertisements with supers and energy like this one..
And do I see Adela Stenberg!! 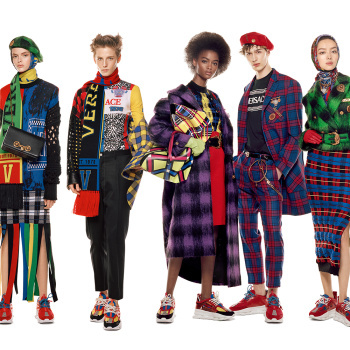 The models based on @versace tags are: Kaia Gerber, Lea Julian, Shanelle Nyasiase, Rachel Marx, Ansley Gulielmi, Oscar Kindelan, Gigi Hadid, Kris Grikaite, David Alexander Flinn, Adela Stenberg, Imaan Hammam, Salomon Diaz, Remington Williams, Sara Grace Wallerstedt, Sohyun Jung, Natalie Ogg, Eduarda Breitas, Emily Gafford, Dylan Fender, Blesnya Minher, Fei Fei Sun, Nora Attal, Fran Summers, Finnlay Davis, Adut Akech, Lexi Boling, Imari Karanja, Vittoria Ceretti, Malick Bodian, Grace Elizabeth, David Trulik, Naomi Chin Wing, Paul Hameline, Hannah Motler, Gisele Fox, Yasmin Wijnaldum, Skylar Penn, Rianne Van Rompaey, Lily Nova, Xu Meen, Heejung Park, Natalie Westling, Hiandra Martinez, Ali Latif, Aube Jolicoeur, Josh Upshaw, Cara Taylor, Aaron Shandel, Joao Knorr, Bella Hadid and Stella Maxwell. I still do missing the male model beside Sara Grace and two girls in Cara Taylor image. Anyone can ID them? Absolutely uninspired! He could've done so much more with this. They look like a bunch of fashion victims. A cast the same size as the population of Lichtenstein and it's a fail! But I suppose it's a win for Versace because the focus is solely on the clothes. I need to know who the girl is in the blue evening dress! My God, that pose. Also Imaan. Such positive vibes and that edible skin. That's it for me.